Capturing the atmosphere, the wave and the Lake Michigan coast & dune. A very popular workshop returns! The class has moved to Wednesday, Thursday and Friday for 2015. 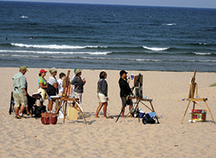 Class will cover the basic principles of oil painting with regard to seascape painting. Painting out-of-doors, en plein-air will be a major focus of the study after the basics are covered. For those who have studied with Douglas before, this overview of principles is always a good review, and new discussions and tips are added each season. 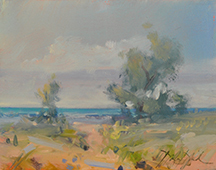 Each day's demo will include simple discussions on composition, massing, building form, light and shadow, near and far, capturing and developing atmospheric distance, building the anatomy of the wave and depending on your own style, knowing when a work is finished (learning how to not overwork your painting). Students will work in their own style/technique so that the finished work is their own. Douglas will overview his palette and concepts his work entails. Students will mix paints and learn to mix basic strings of color to help comprehend the preparation/set up to prepare to paint out-of-doors. Students will work on small canvases, and the emphasis will be on capturing the time of day, atmosphere and geographical elements along the coast in a quick concise way based on the covered principles. Depending on the skill level of each student, students are able to grow and develop at a rate that is to their comfort. Demos and individual discussions/instruction will help each student begin to reach the preliminary goals they are striving to meet. Plan to produce several studies and at least one larger painting. For returning students, bring paintings from last year, and use them as studies to paint larger paintings en plein air with greater ease. Plan to bring notebook/sketchbook and enjoy some demos, along with some great stories to help you remember these principles that are the foundation of Douglas' teaching. Canvases- Quantity 3-4 5" X 7"
Oliver Art Center will provide a classroom for the duration of the class, even though it is an en plein air/painting out of doors workshop. This will allow us to keep extra materials on your worktable and provide a simple way to review each morning, come back to studio if you have too much of the elements and want to finish an afternoon off in studio and of course a place to return in the event of bad weather. Morning: Demo in classroom on how to paint wave. Students to work on studio piece to understand anatomy of wave. Afternoon: Meet back at Oliver Art Center to discuss works, have small show of work accomplished and review specific problems. Last hour: Group work from past 3 days and positive, constructive critique with the focus on future and how to apply materials learned in workshop.